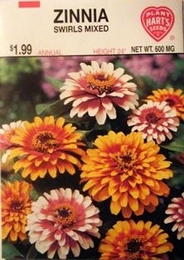 Zinnia is one of the most popular flowers grown today. Swirls Mixed flowers are fully double to semi double up to 4 inches in diameter with float, slightly ruffled Petals. Even a single row in the garden will supply plenty of blooms for cutting. One of the easiest kinds to grow from seed. Satisfactory results can be obtained by sowing as late as early July. Keep flowers picked to prolong blooming.